Sngal Saly villa pool comfort. Villa with 40m2 terrace, tiled table for 10/12 people. garden Lounge . private pool. (part time gardener, pool maintenance products and my dependents). 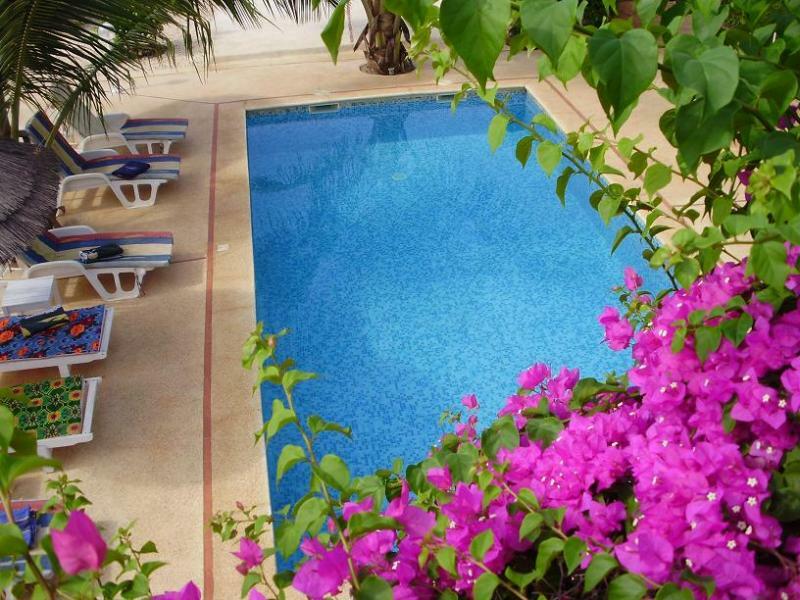 Outside the residence, the house has a private and covered parking with independent access and is located near the most beautiful beach (between the hotel lookéa and port residence), halfway between golf and beach, 2 from the center of Saly and commerce nearby. Pleasant residence with bar and restaurant.vous have access to Boules deprive because I am an associate .you will be warmly welcomed by SONYA our housekeeper and cook mandatory from 10h to 16h 6 euros per day. (the gas is in my care) .in supplement water and electricity to the tenant séjour.une corresponding to his profile with details of the counters will be sent, payable to the housekeeper after control the day of your departure . (cleaning before and after your departure is at my expense). all parts are climatisées.deux rooms on all three are equipped with safe. all beds with mosquito nets. and windows. the single beds are 0.90m has large.et of double bedsare of a 1.60m largeur.tous beds have orthopedic mattresses. a TV in the living room and a TV in the bedroom of the ground floor are available with the possibility to take more channel subscription. 6 beds and mattresses at the pool. .évier outside to clean fish. 2 outdoor showers one by the pool and another with hot and cold water against the maison.la villa is in a residence but outside residence. In the 750m2 wooded garden of tropical plants amid the bougainvillea, opposite the swimming pool we built a kiosk for 10 to 12 people with reading area, bar and fridge to take the aperitif October to mai.un battery system rechargeable by solar panels during the day and by the Senelec electricity network (local EDF) at night allows avoid the inconvenience of power cuts of more and more frequent during breaks against sénégal..par air conditioning, pool lights ,, the washing machine, the pool pump, well pump does not work against .By the lamps, the kiosk. fridges, catches, televisions and the fans fonctionnent.touteswindows and doors are lined and equipped with iron defense for more security and improve your quality of life. I wish you a good holiday in Senegal. to have more channel it is necessary to take the card of subscription and to go in a center of channel more to be valid after regulation by period of one month. WE COME TO ADD A BARBECUE EXTERIOR TO GAS. AIRPORT A 32 KM FROM THE VILLA.POSSIBILITE TO HAVE A DRIVER FOR 15000FRCS CFA THE NIGHT. Successful in an ideal holiday, nothing was missing. The staff were charming, discreet and efficient. Well located and spacious home. Very nice villa, ideally located. The owner was particularly helpful. I recommend. Super home. Very competent and nice. Excellent contact with the owner. Everything was great. HIGH SEASON 1 SEM. 500. EUR. 2SEM.1000.EUR. 3SEM.1300 EUR.4SEM.1600.EUR. LOW SEASON 1SEM.300.EUR. 2w. 600.EUR. 3SEM.900.EUR. 4SEM.1100.EUR.